Most of us do not want to play the fool, to appear to others as though we have lost of our minds and should not be taken seriously. As we begin the period of the Nativity Fast, however, it is important to remember that Jesus Christ brought salvation to the world in what appeared to most people at the time as an unbelievably foolish way. When the eternal Son of God became a human being, He was born in the humble setting of a barn to a virgin mother. We have heard the story so many times that it no longer shocks us, but imagine how it looked to the leaders of the Jewish people at the time who wanted a powerful, respectable political and military leader as the solution to their problem of being occupied by the Roman Empire. They also expected their deliverer to be a strict teacher of religious law who would bring earthly blessings upon the righteous and judgment upon Gentiles and sinners. No, Jesus Christ did not fit their expectations either at His birth or throughout His public ministry. On this feast day of St. Matthew the Apostle and Evangelist, we remember that He called Matthew, a tax collector, to be His disciple. As we remember from the story of Zacheus, tax collectors were Jews who worked for the Romans, collecting more than was required from their own people and living off the difference. Righteous Jews viewed them as a traitors and thieves and would have nothing to do with them. No one would have expected the Messiah of Israel to call a tax collector to follow Him as a disciple, but that is precisely what the Lord did. If that were not foolish enough, He also ate with tax collectors and sinners, which in that time and place was away of participating in their uncleanness. In the eyes of the Pharisees, Christ defiled Himself and broke the Old Testament law by doing so. For the Messiah to act in such ways was worse than foolishness; it was blasphemy and a sign that He was not a righteous Jew, let alone the one anointed to fulfill God’s promises to Abraham. In response, the Lord made clear that His apparent foolishness demonstrated a much deeper wisdom than that of His self-righteous critics. He said that sick people, not healthy ones, are in need of a doctor’s care. He said that He came to call not the righteous, but sinners, to repentance. Think about it for a moment. Who requires healing, the sick or the well? Who needs to repent, those who are already faithful or those who are not? Christ quoted the Old Testament (Hosea 6:6) in reminding His opponents that God desired mercy and not sacrifice. In other words, He related to others in ways that embodied the divine compassion toward corrupt and broken people. He came to help and heal them, to help and heal us. As so many of the Old Testament prophets proclaimed, religious ceremonies are worthless for those who refuse to show God’s mercy to the human beings they encounter every day. That is precisely what Jesus Christ did in associating with tax collectors and sinners in a way that made Him look like a fool in the eyes of many. Saint Paul wrote about the ministry of the apostles that they were fools for Christ’s sake. Before Christianity was popular, established, or well-known anywhere, they left everything behind for a ministry that led to poverty, persecution, and death. Like the countless martyrs of Christian history throughout the centuries and in places today such as the Middle East, the apostles certainly appeared as fools to the vast majority of people in their time and place. Why risk your life for the memory of an obscure Jewish rabbi? Why not burn some incense to Caesar, convert to the religion of a conquering foe, or join the Communist Party? Why throw your life away for the sake of this foolishness about Jesus Christ? It is easy for those of us who face no real persecution for our faith to romanticize the plight of the confessors and martyrs who suffer and die for the Lord. It is more difficult, however, for us to recognize that Christ calls us to be fools for His sake in our lives and our culture every day. 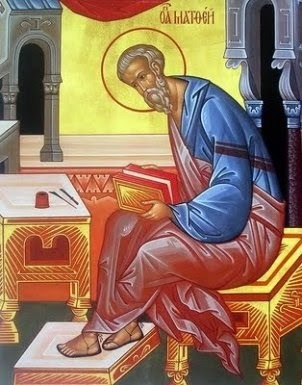 He scandalized the self-righteous by calling St. Matthew to follow Him and by associating with people of bad reputation. Christ did not endorse their sins, but He risked His own reputation in order to lead them to repentance and healing. He showed them the mercy of God by calling them to a new life. Likewise, it may seem foolish to some when we show hospitality, kindness, and friendship to the tax collectors and sinners of our day, to those whose behaviors and styles of life are quite different from the paths to holiness that we seek to pursue as Orthodox Christians. Judging and condemning particular people for any reason is never our place; when we do so, we judge and condemn only ourselves for our pride and self-righteousness, for being like the Pharisees who criticized Christ for keeping company with disreputable people. Let’s be clear. The point is not to abandon the teachings and practices of our faith or to say that all ways of living are equally good and holy. The Lord called His disciples to be more righteous than the scribes and Pharisees, and He expects the same of us. Part of that righteousness, however, is not to abandon human beings, our loved ones, friends, and acquaintances, when they lose their way and even when they make terrible decisions about how to order their lives. Christ calls us to treat others as He treats us. Our Savior looked like a fool to many when He kept company with people known to be sinners, and we should not be afraid to follow His example in order to maintain relationships that serve as signs of God’s steadfast love to broken and confused people whose burdens we never know fully. If they do not experience a measure of the love of Christ through us, then where will they experience it? If they know Christians as those who want nothing to do with them, they will likely never be drawn to the healing and life of the Kingdom. Why would they? What good news do we offer by abandoning them? Of course, we must be careful not to get in situations that we cannot handle. Sometimes relationships end or become so unhealthy that we have to abandon them for the good of all concerned. Those are extreme circumstances and we need to be careful in them. But when it is possible to overcome the stereotypical distinctions between the righteous and sinners of our day in order to show Christ’s compassion even to the most unlikely people, we should not refuse to do so for fear of looking foolish. The Lord certainly had an unlikely circle of acquaintances and we should not be afraid to follow His example. In order to have the spiritual strength and clarity to discern how to become a healing presence in relation to other people, we all need the spiritual disciplines of the Nativity Fast, such as prayer, fasting, repentance, generosity to the needy, and reconciliation with enemies. Yes, these also appear foolish to our culture, especially in a time of year so focused on self-indulgence and material possessions. And here is the great irony, for this season is fundamentally one of preparation to receive Christ Who, both at His birth and throughout His ministry, looked like a fool according to the conventional religious stands of His day. But through what appeared to be foolish, He made—and continues to make– saints out of tax-collectors, prostitutes, adulterers, murderers, Gentiles, and other unlikely characters. So in the weeks before Christmas, let us embrace our calling to live in what may seem to be foolish ways that will draw others to the celebration of the birth of the Savior not only on December 25, but in their hearts and lives every day of the year—no matter who they are and no matter how seriously they have lost their way.